The 2016 results may surprise you. Car-sharing is pro-equity, pro-environment, and pro-opportunity. Last month, BMW launched its car-sharing brand ReachNow in Seattle, expanding into North America from its half-million-member stronghold in Europe, and I’ll admit that even I, a car-free bike commuter, felt a little dzzzzt of mid-life thrill as I downloaded the app: instant access to BMW 3-series sedans, i3 electrics, and Minis. With 700 Bimmers added to the city’s hundreds of practical Zipcars and parkable Car2Gos, surely Seattle must now be the Cascadian capital of vehicular swapping, right? So you might think. But Sightline tallied car-share vehicles at the ready in Portland, Seattle, and Vancouver, BC. (Well, we counted them as best we could; inexplicably, some companies guard their fleet counts like state secrets.) The winner is… coming right up. Car-sharing is pro-equity, pro-environment, and pro-opportunity. When people pay for their transportation by the trip, rather than the vehicle, they drive dramatically less and spend less doing so. They also spend less on fossil fuels and more on other things—things with higher local jobs multipliers. 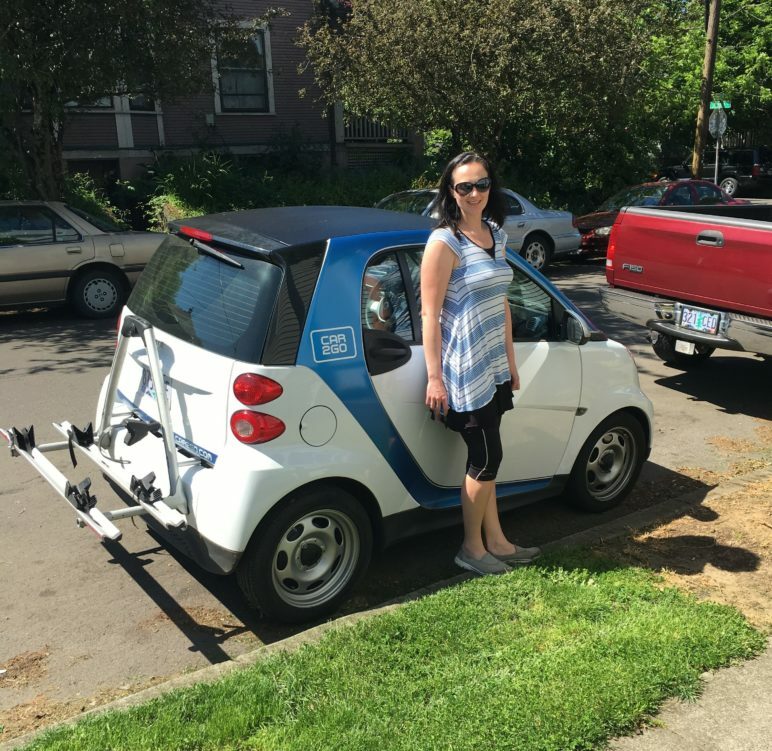 Car-sharing puts the occasional auto trip within reach for people who cannot afford cars of their own, which can make a huge difference for low-income families trying to get ahead in Cascadia’s sprawling, transit-poor cities. In Seattle, some 7 percent of car-share members have shed a private vehicle after signing up to share cars, partly because membership makes ownership less necessary. You can use a car whenever you want; why bother to buy one? Since the 1997 founding of Modo, the BC car-sharing co-op, the 1998 launch of CarSharing Portland and the 1999 Seattle launch of Flexcar, both later absorbed by Zipcar, Cascadia’s top three cities have welcomed a total of seven short-term rental options: Modo and Zipcar provide two-way car sharing, in which you bring the wheels back to where you picked them up. Getaround and Turo (formerly Relay Rides) do the same thing using a person-to-person approach—like Airbnb but for cars. Private owners rent out their vehicles in idle hours to strangers, through the internet. Meanwhile, Car2Go, Evo and ReachNow follow a one-way model; you leave the vehicle curbside anywhere within the company’s citywide service area. The vehicles float freely around town, typically picked up by a driver within an hour of being parked by another member. Update 5/13/2016: A knowledgeable reader notes that Enterprise Carshare and U-Haul Carshare probably have another 20 vehicles scattered around Cascadia. These ventures are tiny, especially considering the scale of their parent companies, but they’re worth mentioning. Update 7/18/2016: As of June 22, Zipcar is now offering one-way trips with 100 vehicles distributed throughout Seattle. Unlike the “free-floating” Car2Go or ReachNow options in Seattle that allow members to drop off a car at any legal parking space, Zipcar members have to return cars to a Zipcar designated spot located on-street, on private lots, and at the Seattle-Tacoma International Airport. Altogether, Sightline tabulates 5,718 car-sharing vehicles in Cascadia. That’s just 0.4 percent of these cities’ estimated 1.4 million motor vehicles, but at any moment on city streets, more than 1 percent of moving vehicles are typically car-shares, because shared vehicles are driven much more of the time than private cars, which on average sit parked more than 23 hours a day. In the cities’ dense, close-in neighborhoods, car-shares account for an even larger share of moving autos, sometimes as much as 5 percent—an impressive change in just a decade or two. Of Cascadia’s almost 5,800 shared automobiles, nearly half are in Vancouver, BC, as detailed in the table above, making the city on Burrard Inlet the car-sharing-est of them all. The city has 2,550 shared vehicles, of which half are Car2Gos. In fact, in July 2015, Vancouver surpassed Berlin as the world’s leading Car2Go market. Innovating to adapt to Vancouverites’ weakening relationship to vehicle ownership (one-fourth of households in the core of the city are car-free), the BC Automobile Association launched its own one-way sharing service in March 2015. Called Evo, it now offers 600 five-passenger Toyota Priuses, each with a roof rack for hauling outdoor gear. Feeling the competition, Car2Go added 25 four-door Mercedes to its fleet of two-passenger Smart Cars just months later. Vancouver’s third-largest car-sharing company is Modo, the oldest of all the region’s companies. The member cooperative manages 450 vehicles, including electrics. It started small with two automobiles and 16 drivers in Vancouver’s West End some 19 years ago, but it now has more than 15,000 members. It also provides car-sharing services to 400 businesses, 100 building developers, and the employees of municipalities, including the City of Vancouver. Vancouver’s car-sharing scene is flourishing, but the Rain City does lack one thing. It has no person-to-person auto-exchange: neither Turo nor Getaround operates there. Seattle is next on the league table with a total of 1,993 shared autos with Car2Gos leading the pack of Seattle car sharing. Like Vancouver, Seattle is a Car2Go leader. Its 750 Smart Cars and 77,000 members make it the company’s second largest US market, after Washington, DC. BMW’s ReachNow service is catching up with Car2Go, adding 330 cars since they debuted in April, bringing the Seattle fleet to 700. Zipcar and Turo fill out the offerings in Seattle with an additional 500+ vehicles. Update 12/10/16: With the influx of 330 more ReachNow vehicles, Seattle is catching up quickly with Vancouver. ReachNow now serves the entire Seattle city limits and has a total of 700 cars. Update 12/10/16: ReachNow launched in Portland this September with about 200 vehicles. Currently, the fleet includes 360 BMW 3’s, BMW X1 SUVs, electric i3’s, and Minis. In less than four years, Seattle and especially Vancouver left Portland in the dust, demoting it from most to least car-sharing in Cascadia. In the next four years, though, the lead could change again. Perhaps person-to-person car-sharing will take off, a category in which Portland is already out front. Or perhaps something else will shift. Who knows? Car-sharing is still new and changing quickly. What’s not changing about car-sharing, though, is that it fills a key gap in urban transportation systems that rely heavily on transit and active transportation. Along with taxis and ride-sharing services, it provides a fallback option that gives everyone the confidence to leave their private cars at home. The exciting news, too, is that in the hearts of all three cities, car-sharing is combining with a burst of compact new development, better transit, ride-sharing, cycling and walking infrastructure, bike-sharing, and telecommuting to make low-carbon, car-lite living ever more prevalent. The trends reinforce one another and could accelerate, especially if self-driving electric vehicles work their way into the mainstream quickly and if Oregon and Washington join British Columbia in putting a price on carbon pollution. improvement in human health, as collisions and injuries decline with driving rates, as safer vehicles saturate markets more quickly, and as safer modes—transit, walking, cycling, telecommuting—increase. All that, and I get to tool around in a Bimmer every now and then! Note on Methods: Sightline gathered published data on car-sharing and requested information from car-sharing companies. Zipcar gave us ranges, and we report the mid-points in this article. Neither Getaround nor Turo told us how many vehicles are enrolled in their programs. We used their member reservation systems to count available vehicles in Portland and Seattle. Unfortunately, we cannot confirm whether all enrolled vehicles are displayed on their websites at any given time. On different days, we found slightly different numbers of vehicles listed. In 2012, Getaround’s website listed some 328 vehicles in the Portland area; in April 2016, its site listed 90. Update 12/10/16: We updated the post because Seattle’s ReachNow service has increased its fleet to 700 and launched in Portland with 360 vehicles. Update 9/19/2016: We updated the post because there are now 500 Zipcars in Seattle due to its one-way service. Update 7/18/2016: We updated the post because Seattle’s ReachNow service has increased its fleet from 370 to 520. In addition, ZipCar announced one-way services in Seattle with part of its fleet. Thanks to Sightline fellow Alyse Nelson, who researched this article. Has the insurance problem been solved with person-to-person carsharing? My policy states clearly that my car is not covered if it’s hired out for payment. Personal insurance doesn’t cover rentals. Additional insurance is provided by the rental company. Both Oregon and Washington have reformed insurance rules (with Sightline’s help) to make clear when owners’ insurance is responsible and when the car-sharing company’s insurance is responsible. I do not know the insurance details in British Columbia. Great read. One little point, that I know my friend Dave Brook is too polite to mention: CarSharing Portland was the 2nd carshare in Cascadia, launching just after we launched Modo, in 1998 I believe. Flexcar proper started the following year, but did eventually purchase CarSharePortland. Thanks, Kevin. Props to Dave, a longtime leader in this field, who helped us put together this article. I’ll adjusted the text above. I have a vague recollection that some other small-scale, cooperative car-sharing experiments were running elsewhere in the region in the mid-nineties. No? Victoria? Olympia? Sorry to post it here but I figured this has a better chance of getting your attention. I was reading your post about occupancy limits of cities, but could not download the detailed version that has the sources you used. I tried to do some research on my own, trying to find by-laws in Vancouver BC that limit the number of people who can live in a dwelling unit, but I could find none. Would it be possible for you to either fix the broken link or re-upload the detailed pdf file? Thank you very much! Thanks to David Ball for supporting a sustainable Northwest.